Homecoming Chefs Dinner Recap | BRAVO! Written on August 4, 2018. July 23, 2018 was a unique evening at BRAVO! Italian Restaurant & Bar. 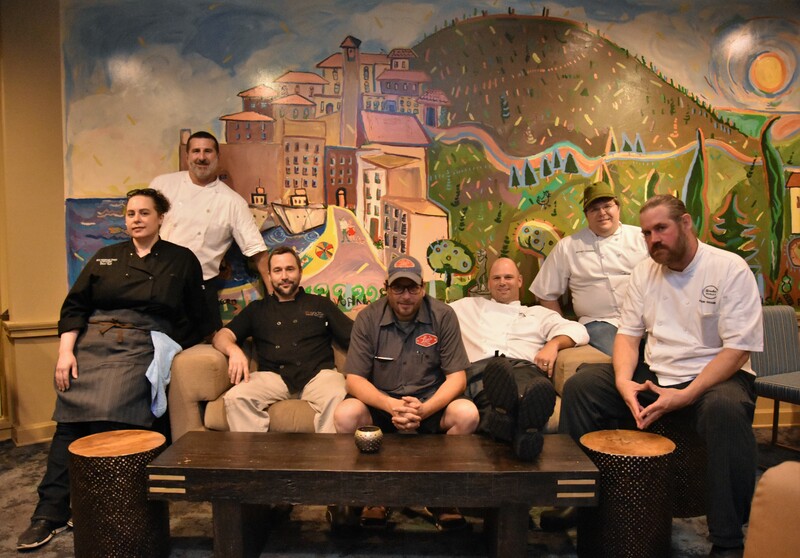 As guests filled up the elegantly set dining room, the kitchen had been filled for hours with a sight rarely seen in any restaurant: six chefs, all of whom began their careers at BRAVO! They were industriously preparing for the evening ahead while laughing and trading stories from their days at BRAVO! The chefs are all now successful in their own restaurants and ventures, but the atmosphere wasn’t one you would expect from so many driven personalities. There were no Cut Throat Kitchen vibes, but instead the banter of old friends catching up and people leaping in to help when needed. As delicious aromas began wafting out to hungry guests, the BRAVO! team spirit held true. Six chefs jumped on board for this six-course tour de force. Chef Jason Goodenough, of Carrollton Market, Chef Jay Parmegiani of 10 South Roof Top Bar & Grill and Roca Restaurant & Bar, Chef Louis Larose of Lou’s Full-Serv, Chef Matthew Kajdan of Estelle Wine Bar & Bistro, Chef Jeffrey Gardner of Hot Corner, and Pastry Chef Dani Mitchell-Turk of For Heaven’s Cakes & Catering all answered Dan’s call. Each chef was responsible for a course for the evening – and got to pick it based on how quickly they answered. BRAVO!’s Homecoming Dinner was its most popular event ever, selling out in a day, and the buzzing dining room full of familiar faces reflected that energy. As BRAVO!’s service team expertly shepherded food and wine out to guests, the chefs took a minute to introduce themselves and their dishes and then mingle with the crowd. From one end of the dining room to the other, glasses and plates clinked, and laughter and murmured appreciation echoed.